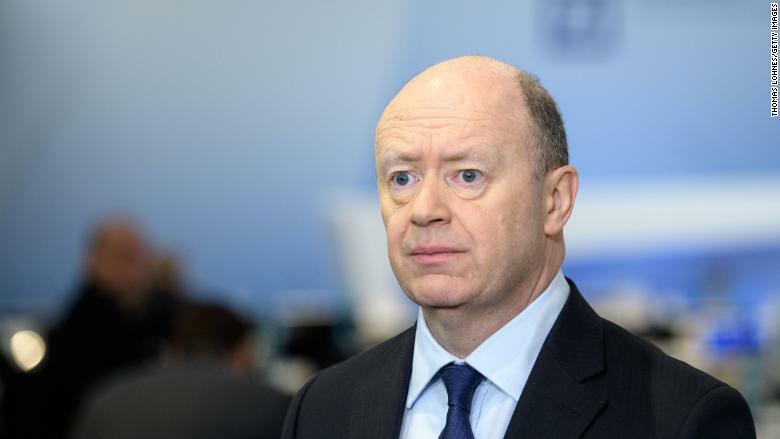 John Cryan has run out of time in his efforts to turn Deutsche Bank around. Deutsche Bank, Germany's biggest lender, is getting rid of its CEO after years of heavy losses. John Cryan, who became CEO of the embattled bank less than three years ago, will leave at the end of this month, the company said in a statement late Sunday. He's being replaced by Christian Sewing, a 47-year-old executive who has worked for Deutsche Bank for nearly three decades, most recently overseeing its wealth management and retail banking businesses. "Following a comprehensive analysis we came to the conclusion that we need a new execution dynamic in the leadership of our bank," Paul Achleitner, the chairman of the company's supervisory board, said in the statement. British-born Cryan, 57, tried to overhaul the giant lender to help it compete with its international rivals on Wall Street and beyond. He closed hundreds of bank branches and axed tens of thousands of jobs. But his efforts haven't been enough to bring the company, which has been dogged by problems dating from the 2008 financial crisis, back into the black. It posted an annual loss for 2017 of €500 million ($610 million). That followed losses of €1.4 billion ($1.7 billion) for 2016 and €6.8 billion ($8.4 billion) for 2015. Investors have shown little confidence in the bank's prospects: its stock has lost nearly two-thirds of its value in the past three years. News of the change of CEO gave Deutsche Bank (DB) shares a bit of a lift Monday. The stock was up more than 3% in morning trading in Frankfurt. When Deutsche Bank reported its most recent loss in February, Cryan pleaded for more time. "When I took up this post two and a half years ago, I aimed to bring Deutsche Bank to a position where it could achieve its full potential," he said. "It has always been clear that it would take more than two or three years." Achleitner thanked Cryan for his efforts, saying that "despite his relatively short tenure as CEO," he has "laid the groundwork for a successful future."